Our 2010 Season in Harvard Square has finished with a nice light snowy day on Dec. 20th. Thanks to all the visitors that stopped by for pictures and contributed to our partner non-profits and charities. Thanks to all the Harvard student groups that sang at the Big Skinny Crimson Wallet. Read below to learn about these great organizations who braved winter weather this year to increase awareness of their work and raise money. The designers of the World�s Thinnest, Smallest and Lightest Wallets have now created the World�s Largest Wallet! 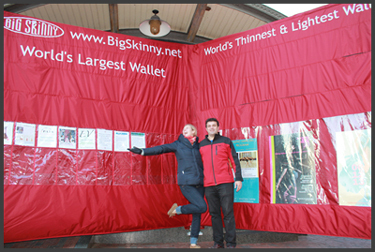 We took our internationally best-selling "world wallet" model and blew it up to Big Skinny proportions: 10 feet tall and 21 feet long when open, 10 1/2 feet wide when closed -- which sets a new Guinness World Record! And since we know how hard it is for non-profits and charities to raise money and awareness for their organizations, we wanted this large wallet to help � just in time for the busiest giving � and buying � season. 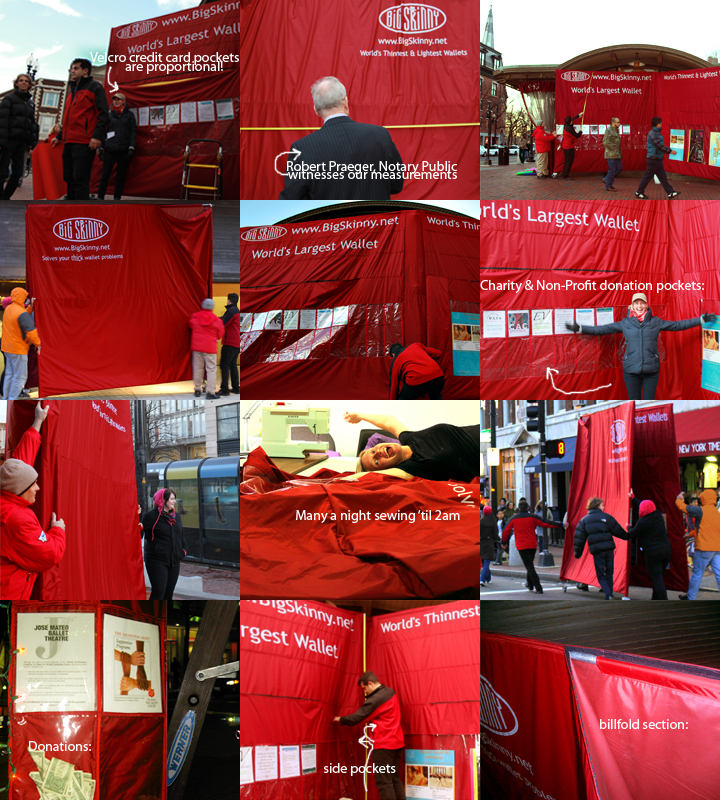 The World�s Largest Wallet in crimson was on display in Harvard Square, Cambridge, MA. from November 29th to December 20th almost every day from approximately 11am to 7pm. Each non-profit listed below had representatives that stood by the big crimson wallet answering questions about their group as well as accepting donations. There were also donation pockets with pamphlets for all other participating non-profits at the wallet so there were many giving choices. 100% of proceeds go directly to the non-profits. Will you open your wallet and give back to those in need? There was large crimson wallet in Harvard Square making it easy and now you can do it also online. Interested in the making of this large crimson wallet, sewn right here in the offices of Big Skinny in Cambridge, Massachusetts? Click here to see all that was involved along with some fun factoids! Founded in 1986, Jos� Mateo Ballet Theatre's company and school have forged a new model for a ballet organization through innovative programming, artistic excellence, and extensive community outreach. Critically acclaimed, Jos� Mateo Ballet Theatre is distinguished as the only ballet company in New England to produce an entire repertory by it's own resident choreographer. After performing at Boston's Emerson Majestic Theatre for a decade, the company has been based at the Sanctuary Theatre since 2001. The school, which provides expert dance training to young dancers ages 3-18 and adults of all ages and levels, has been a leader in creating broader access to the art form. It has developed an inclusive approach with new teaching methods that allow students to excel beyond expectation. During the literal opening of the World�s Largest Wallet---Festivities included holiday music, lights and a performance by the Jose Mateo Nutcracker dancers. A fun way to commence the season of giving! Since 1887, the Salvation Army has been serving the globe with dozens of community outreach programs. The Salvation Army, an international movement, is an evangelical part of the universal Christian Church. Its message is based on the Bible. Its ministry is motivated by the love of God. Its mission is to preach the gospel of Jesus Christ and to meet human needs in His name without discrimination. "We are carriers of hope. A shoulder to cry on in desperate times. We are role models in business and everyday life, making a positive contribution to our communities. We are those who seek to be living examples of Christ�s love." In partnership with China-based AOS and with generous support from DC-based Medical Care Development International, PATS was established in June 2007 as a one-year pilot program to test the effectiveness of our model: using trained community health workers to provide care, education and support to 16 of AOS's HIV-positive children and their caretakers. Pediatric AIDS Treatment Support (PATS) currently supports 45 HIV-positive children in central China who were infected by parents who contracted HIV through paid plasma donation. We work with communities to ensure that these children have comprehensive medical care, access to life saving HIV/AIDS medications, nutritional support, and educated caretakers who know how to best meet their needs. HSHS is a dry shelter that provides a drug-free, alcohol-free, and smoke-free environment run by student volunteers from Harvard University who are devoted to helping shelter guests exit the homeless status. They assist in housing applications, food stamps, immigration information, identification cards, healthcare, eye-care, listening and support, public benefits and other resources that will serve our clients in the best manner possible. Old Cambridge Baptist Church is located in Cambridge, Massachusetts three blocks south-east of the redline Harvard Square T-Stop. They are a progressive and inclusive Christian community in the American Baptist tradition that seeks to answer God's call to hold fast to love and justice for all the earth and its peoples. OCBC has been a welcoming and affirming church since 1983. They invite people from all backgrounds and walks of life to worship on Sunday mornings. Solutions at Work helps people transition out of homelessness. Founded in 1989, they remain true to their dual mission: helping homeless people advocate for their own needs and breaking the economic chains that bind people in homelessness. Led and run by homeless and formerly homeless people, their programs bridge the gap between being homeless and living again as stable members of the broader community. Most of their programs recycle high-quality items that would otherwise be discarded or sold, such as children's clothing, toys, books, and gear; interview-appropriate business attire for adults; and computers. EV transforms lives and builds community by connecting school-age children and teens from disadvantaged urban neighborhoods with Harvard student volunteers in long-term tutoring and mentoring relationships supported by family and school advocacy. Founded in 1980 by Marie-Claude and Brian Thompson, EV started as a rural summer camp for inner-city children and expanded five years later to a Tutoring and Mentoring Program to address the struggles and needs of our children throughout the school year. Molecular Frontiers is a global effort to promote the understanding and appreciation of molecular science in society. Molecular Frontiers makes a strong effort to engage the young generation in its pursuit. Through Internet activities, illustrating how molecular events govern much of the world we live in, Molecular Frontiers will inspire young people to scientific curiosity. The CYCLE Kids mission is to get children on bicycles and engage them in a physical activity that addresses the health and emotional issues facing today�s under-active, often overweight children. Their program encourages confidence, curiosity, and independence, supports efforts to live more environmentally conscious lifestyles, and teaches children a skill they will have for a lifetime. The Cambridge Arts Council (CAC) is the official arts agency for the City of Cambridge, MA. Established by City ordinance in 1974 and incorporated as a public non-profit in 1976, CAC's mission is to ensure that the arts remain vital for people living, working and visiting Cambridge. As both a service and presenting organization, CAC accomplishes this mission by stimulating public awareness of and support for the arts, preserving and celebrating the City's diverse cultural heritage, displaying art in public places, and developing opportunities to improve the overall aesthetic experience for residents and visitors of Cambridge. Medulla Thyroid Cancer Research at Johns Hopkins Big Skinny is personally sponsoring the research of Dr. Douglas Ball who, in conjunction with colleagues in cancer research and cancer genetics is embarking on an ambitious project to sequence virtually all of the protein coding sequences in the approximately 22,000 genes in the humane genome in a sample of MTC tumors. The goal of this effort is to uncover a complete catalog of all the mutations seen in MTC tumors. Donations to the specific research of Medulla Thyroid Cancer are in memory of Kiril�s father, Dr. Stefan Alexandrov who passed away last Christmas. Thanks to some of our local sponsors! Sewn by Big Skinny Marketing Director/cat-of-all-trades Catherine Alexandrov and her mother, Linda Brown, the massive wallet was constructed in our offices right here in Cambridge, Massachusetts. The �bones� or �endo-skeleton� was created by Kiril Stefan Alexandrov with brainstorming from folks at Home Depot, father-in-law Don Brown, uncle-in-law Bruce Mostrom, and assembly by all in the office. After all, we are a family company. The wallet was modeled after our World Wallet, a wallet designed to accommodate all types of international currency as well as lots of credit cards. Are you curious about what went into the making of the wallet? Here are some factoids! -10.5 feet by 10 feet when closed, 10 feet tall and 21 feet long when open. Wow! -171 feet of our proprietary nylon micro-fiber were used [57 yards! ]� this is the same material we make all of our nylon wallets out of, so we know it�s durable and water-resistant! - Only 1/4 of an inch thin! - 48 pounds of nylon micro-fiber� because we use such a thin, lightweight, durable material, this gigantic wallet doesn�t weigh much more than a 4-yr old child! - total weight with special supportive endoskeleton and wheels is only 128 pounds. - 8 wheels make the wallet portable! -160 hours of labor went into just sewing the wallet, with two people working on it! Another 45 hours on the endoskeleton and assembly. - 452� the amount of times Catherine and others were stabbed by pins when sewing this massive wallet!